The staff training before the show (including how to engage with customers - unlike the staffer with his hands in his pockets in this photo). See training tips below. For effective scheduling, you want to ensure you have enough booth coverage to successfully meet and greet prospects, project an image of professionalism and confidence, and effectively pre-qualify booth visitors to garner sales leads. Some trade show veterans use sophisticated trade show staffing formulas to determine how many team members should work the trade show booth; while others determine schedules based on budget constraints and staff availability. As a rule of thumb, four hours is the maximum that someone should be scheduled to work a shift at your booth without taking an extended break. A two-to-three hour shift is ideal. Your staff should always arrive at your trade show booth 15 minutes before a shift starts to ensure a smooth transition for customer and prospect servicing. Those working the first shift of the day, must arrive early enough to make sure your booth is completely set up. Convention attendees should not see you still unpacking boxes and not fully prepared during exhibit hall hours. 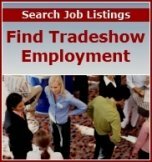 Absolutely essential to your success at a given event is comprehensive training of your trade show convention display staff members so each person is thoroughly familiar with all aspects of your product. Yet for many exhibitors, before-the-show training is often incomplete, rushed or inadequate to yield the type of results or sales potential an event offers. Tradeshow expert and author Steve Miller suggests in his book, How to Get the Most out of Trade Shows, that you should spend at least a full day of hands-on training at your facility with your tradeshow display booth staff. To make sure everyone knows the ins and outs of your product before leaving for the show, have your team talk with product engineers, designers or developers. The more they learn through actual, experiential training and interaction, the more they’ll remember and use in the selling process. Talking with customers (who agree to meet with your staff), reviewing product satisfaction surveys and evaluation forms, and researching competitor offerings will give everyone attending the show greater insights to help more effectively represent your product to prospects. Another important training component is to have your tradeshow display booth team review all marketing collateral and advertising your company uses to promote your product. This will give everyone a greater sense of brand positioning and the customer selling proposition. Develop a thirty-second script or “elevator speech” that describes your product features and benefits. Then have everyone rehearse it so all team members can consistently, effectively and effortlessly talk about your product, explain how it helps and serves users, and discuss why it is better than others available on the market today.